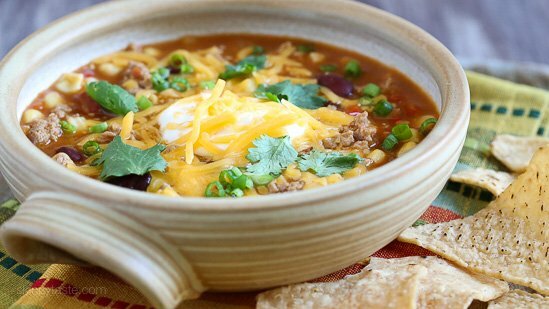 This quick & easy Turkey Chili Taco Soup, filled with beans, tomatoes and corn is one of my favorite soups for lunch or dinner! It takes just 20 minutes to cook but it tastes like it was simmering for hours! 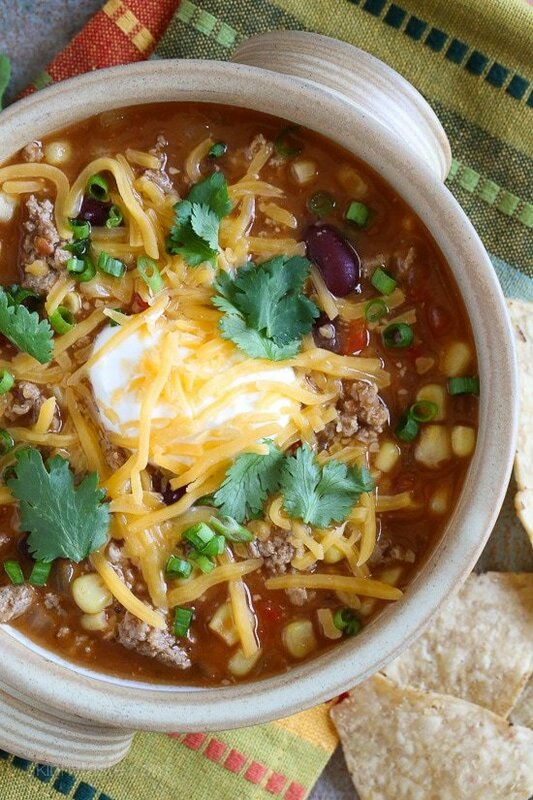 It satisfies my cravings for chili and soup, all in one! 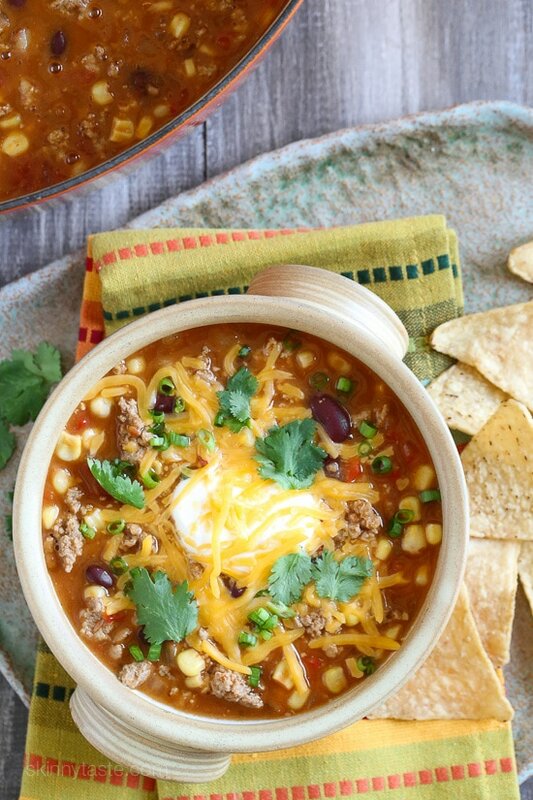 Top it with your favorite chili toppings such as sour cream, cheese or whatever you like for a healthy meal that can be prepped for the week or frozen for another night. When I worked full time in the city, on those occasions I don’t bring leftovers for lunch, my go-to was the Turkey Chili Soup from Fresh and Co. This homemade version is just as good, and so much cheaper than buying it! Light, healthy and super filling! Now I know I have quite a few chili recipes on my site, but this one is perfect when you need a quick meal. Adapted from my friend Julia’s recipe, of Julia’s Healthy Italian Cooking. She’s an amazing cook, a working mother of four, and always cooks her family quick healthy meals made from scratch. When reheating, to thin it out simply add more broth or water. To freeze, transfer to a freezer-safe container and freeze. To reheat, thaw overnight in the refrigerator then reheat on the stove or microwave. You can see more Soup Recipes here! Top it with your favorite chili toppings such as sour cream, cheese or whatever you like for a healthy meal that can be prepped for the week or frozen for another night. Spray a large pot with cooking spray then brown the turkey over medium heat, breaking up with a wooden spoon as it cooks. When cooked through, add the onions and pepper and cook 2-3 minutes. Add tomatoes, corn, beans, tomato sauce, re-fried beans, taco seasoning and chicken broth. Bring to a boil, cover and simmer about 10-15 minutes. Serve with your favorite toppings such as low fat sour cream, jalapeños, reduced fat cheese, chopped scallions, onions, or chopped fresh cilantro. Freeze leftovers in individual portions for future meals.